11 out of every 12 stones sold in the world pass through India, making India world’s largest manufacturer of cut and polished diamonds at US$ 9.77 billion (Rs.44106.95 crores). India overtook Israel and the United States in the diamonds business, India now supplies 85 % of world’s polished diamonds, measured by volume. India produces almost none of the world’s diamonds, But today India dominates the polishing business. Diamond production in India can be traced back to the 8th century BC, when the first ever diamond in the world was mined in India. Some of the world’s most famous diamonds – Great Moghul, Kohinoor, Hope, Idol’s Eye, etc. were born in India. Most rough stones are mined in Angola, Botswana, Namibia and Russia. Rough gems are imported to Bombay from dealers in London, Antwerp, Tel Aviv, and New York, taken by these couriers to cutting and polishing centers in Gujarat state, and then carried back to Bombay to be re-exported to rest of the world. Diamond cutting and polishing workshop in India. 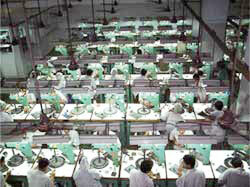 Cheap labor allowed India to find a niche for itself in the diamond-polishing business. The Indian diamond cutting centers are concentrated in Bombay and Surat(Gujarat state), a small town about five hours away from Bombay. 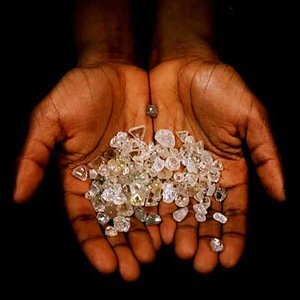 Indian government makes huge effort to eliminate blood diamonds, as a way to ensure that India’s diamond business is not spoiled by illegal and inhumane practices.